I’m delighted to help celebrate the dog days of summer! Since my first mystery revolves around a feisty German shepherd named Bella, I decided to share a little about the two German shepherds that have inspired my writing. I barely remember the far-from-perfect German shepherd my parents owned when I was a preschooler. She barked, chased the cows, and had a passion for hunting skunks, porcupines, and most any other critter that would fit in her mouth. In my mind, Duchess was a veritable Lassie. Unfortunately, my parents didn’t agree. After an ill-fated altercation with a neighbor’s cat, Duchess was sent to a new home. I never quite got over the loss, and I vowed that I would someday own a German shepherd of my own. Fast forward about thirty-five years to the day I picked up my eight-week-old bundle of fur. I vowed to not repeat the mistakes of my parents. I vowed to do everything “right.” I studied books about German shepherds and enrolled in multiple dog training classes. I told everyone my dog would be the paragon of proper doggy behavior. I should have known I was in for trouble the day Tasha chewed up all of my dog training books. Cursed with a variety of illnesses and a fearful temperament, Tasha will never be the poster child for German shepherd temperament and behavior, but every day I get to spend with her is a gift. She’s taught me patience and creativity, and she’s forced me learn how to give up control. Most of all, she’s shown me that I can give love unconditionally, even when the recipient is far from perfect. Tasha has made me a better human being. 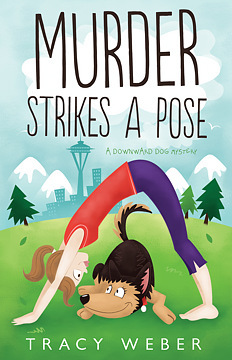 My first mystery, MURDER STRIKES A POSE, involves a yoga teacher, Kate Davidson, and her German shepherd sidekick, Bella. Like Tasha—and Duchess before her—Bella is huge, often unruly, and smarter than most human beings. She sometimes gets Kate into trouble, sometimes saves her from it. Above all else, she’s the love of Kate’s life. I can’t wait to see how their path unfolds in the rest of the Downward Dog Mysteries. Writing about yoga, dogs, and murder. What could be more fun? Please check out MURDER STRIKES A POSE, available January 8, 2014 from Midnight Ink! 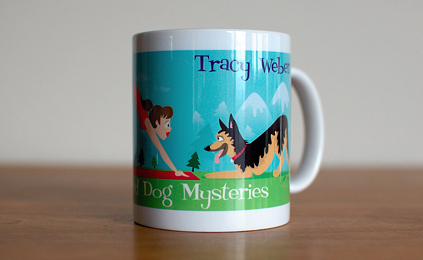 http://tracyweberauthor.com/books.html. Murder Strikes a Pose introduces Kate Davidson, a feisty Seattle yoga instructor who’s more interested in savasana than solving crimes…. until she stumbles over a body in the studio’s parking lot. The police dismiss the murder as drug-related street crime, but Kate knows that George—a homeless alcoholic she had befriended—was no drug dealer. “Great characters, keep-you-guessing plot, plenty of laughs, and dogs—what more could we want?” —SHEILA WEBSTER BONEHAM, author of THE MONEY BIRD, Animals in Focus Mystery #2. 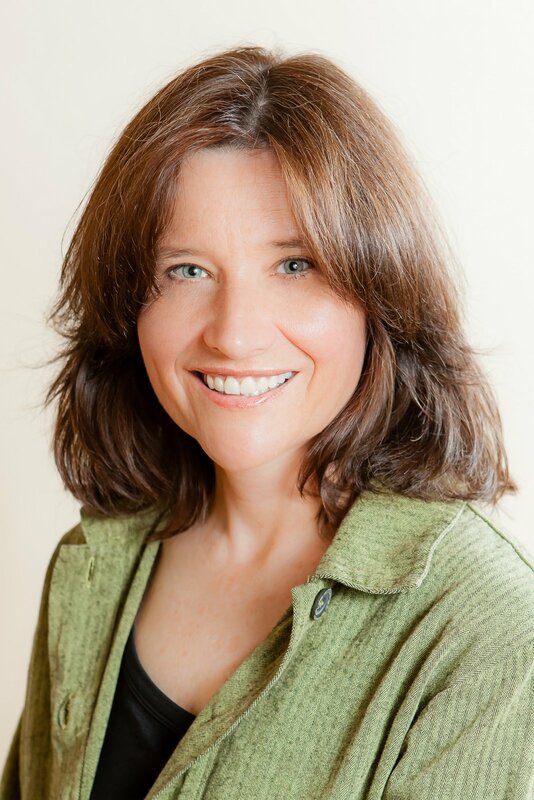 Tracy Weber is a certified yoga teacher and the founder of Whole Life Yoga, an award-winning yoga studio in Seattle, where she currently lives with her husband and German shepherd. 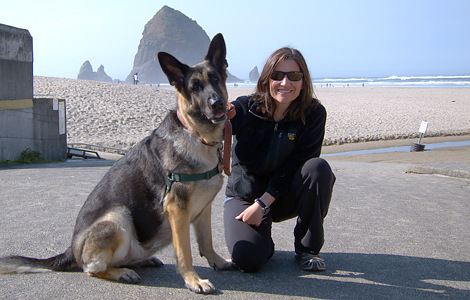 Weber is a member of the Pacific Northwest Writers Association, Dog Writers Association of America, and Sisters in Crime. She loves sharing her passion for yoga and animals in any form possible. Murder Strikes a Pose is Weber’s debut. For more information, visit her online at TracyWeberAuthor.com and WholeLifeYoga.com. Please come back next week! On Monday author Christy English writes about changing genres, and on Thursday I'll be here with some updates on the launch of The Money Bird, Animals in Focus Mystery #2 featuring photographer Janet MacPhail, her Australian Shepherd Jay, her orange tabby Leo, and a whole lotta wet dogs! Have a creative weekend. Read with a furry friend! Will there be a Kindle edition of the book released with the print? Hi Susan! I think our dogs are a lot alike. And yes, there will be Kindle and Nook versions, as well. I hope you read and love it! As a parent to two canine fur-kids with minds of their own, Tracy, I love your description of Tasha--and Bella! Thanks, Linda! I'd be honored to have you read the book someday!